MoUs were signed between five States and one Union Territory with the National Health Mission, Government of India to implement 'Ayushman Bharat', a mega scheme to provide free health treatment upto Rs. 5 lakh to the people living below poverty line in the presence of Union Health Minister JP Nadda and Chief Minister Jai Ram Thakur here today.Five such workshops would be held throughout the country to launch this ambitious scheme. 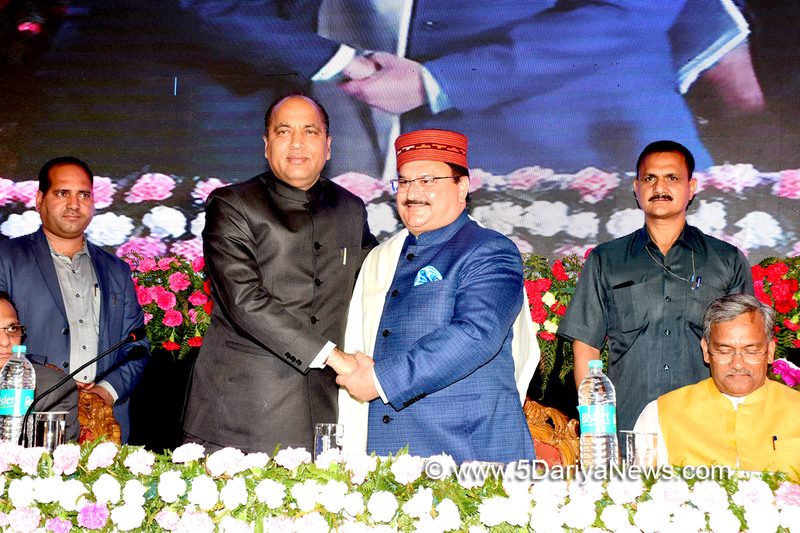 The scheme would benefit over 10 crore families of the country and provide free treatment to about 15.31 lakh people living below poverty line in the State of Himachal Pradesh.While addressing the Ayushman Bharat Northern Region first Workshop on Pradhan Mantri Rashtriya Swasthya Suraksha Mission (PMRSSM) on the occasion, Chief Minister Jai Ram Thakur said that the Ayushman Bharat was an innovative scheme launched by the Union Government under the able leadership of Prime Minister Narendra Modi. He said that the Union Government has laid special emphasis and stress on health and agriculture sectors in the Union Budget. He said that the State was forging ahead on path of progress and prosperity in all spheres of development. He said that the achievements of the State in health sector were commendable.The Chief Minister said that today the State has six medical colleges in Government sector and the Government has decided to establish a Medical University for their effective management. He said that the Union Government has sanctioned an AIIMS for the State which would be established in Kothipura in Bilaspur district. He said that the Union Government has sanctioned Rs. 1351 crore for establishing the AIIMS.He said that Ayushman Bharat was the biggest health insurance scheme of the world and this has potential to bring revolution in the health sector in the country. Union Health Minister Shri JP Nadda said that the Ayushman Bharat was a brainchild of Prime Minister Narendra Modi. He said that with this scheme, the weaker sections of the society would be provided free medical treatment upto Rs. five lakh. He said that 20 AIIMS institutions were being opened in the country for providing best health care facilities to the people of the country nearer to their homes.JP Nadda said that 1.50 lakh health sub centres in the country would be converted into Wellness Centres for early detection of diseases. He said that Universal Health Check-up would be ensured of all the people before they attain 30 years of age. He said that this would ensure reduction of diseases burden on the nation. He said that treatment of all the major ailments have been included in this mega scheme. He said that the MOUs between the five States would go a long way in providing health cover to the masses. He also appreciated the efforts of the State Government to propose opening of Medical University in the State.Chief Minister of Uttrakhand T.S. Rawat said that the State of Himachal Pradesh and Uttrakhand share similar topography and geographical conditions and providing health care facilities to the patients in the remote areas was quite challenging. He said that for this all the big hospitals were being developed as e-hospitals.Health and Family Welfare Minister Punjab Brahm Mohindra also spoke on the occasion and detailed achievements in the health sector in his State.Health and Family Welfare Minister Jammu and Kashmir Dr Davinder Kumar Maniyal said that the state of Jammu and Kashmir would take the health sector to new heights. Health Minister Himachal Pradesh Vipin Singh Parmar said that it was an honour for the State of Himachal Pradesh that the first Regional Workshop on Pradhan Mantri Rashtriya Swasthya Suraksha Mission was being held in the State. He said that the State was implementing RSBY in the State under which 4,83,643 families have been registered. He said that Mukhya Mantri Swasthya Rahat Kosh has been established in the State by making a provision of Rs 10 crore in the budget.Secretary Health and Family Welfare Government of India Preeti Sudan said that the role of the scheme would be consultative and the major role would be of the State Governments. She said that robust IT system was needed for ensuring transparency in implementation of this scheme. She said that the Centre Government would also provide all possible help to the State Governments for its implementation.Member Health NITI Aayog Dr V.K. Paul said that being the largest health insurance scheme of the world, it requires great commitment and efforts to make it a success. He also stressed on strengthening of comprehensive primary health care facilities in the country.CEO National Health Agency Dr Indu Bhushan said that this day was historic as on this day a most ambitious health security scheme was being launched for the benefit of the people of the country. He said that a special IT platform and special call centre were being established to effective implementation of this scheme.Principal Secretary Health Parbodh Saxena welcomed the Chief Minister and other dignitaries present on the occasion.Education Minister Himachal Pradesh Shri Suresh Bhardwaj, MP Shri Virender Kashyap, MLA Shri Narinder Bragta, Chief Secretary Shri Vineet Chawdhry, Mayor MC Shimla Kusum Sadret, Director Health Services Dr. Baldev Thakur, Principal IGMC Shimla Dr. Ravi Sharma, were present on the occasion among others.